Friday Music is very pleased to welcome back the amazing 180 Gram Audiophile 4 LP Box Set of the Grateful Dead’s "Spring 1990 · So Glad You Made It." This super limited edition treasure trove highlights selections from five of their finest shows from this legendary tour. Filled with twenty unreleased stellar performances, The Grateful Dead’s Jerry Garcia, Bob Weir, Phil Lesh, Brent Mydland, Mickey Hart and Bill Kruetzmann truly radiate with some of their finest playing and singing ever, making this a wonderful listen and collectible album for years to come. Mastered for audiophile vinyl by Jeffery Norman with Joe Reagoso at Friday Music Studios and at Capitol Records, Hollywood, CA, this wonderful album is truly a welcomed addition to your Dead collection. 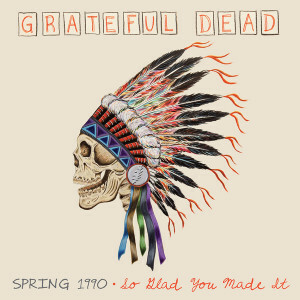 The Grateful Dead’s "Spring 1990 · So Glad You Made It" album will be packaged in a stunning box set, with Wes Lang’s artwork detailed beautifully, with a poly lined LP sleeve to preserve the rich details of each of the four 180 Gram vinyl albums, including wonderful custom LP label artwork provided for each vinyl album.